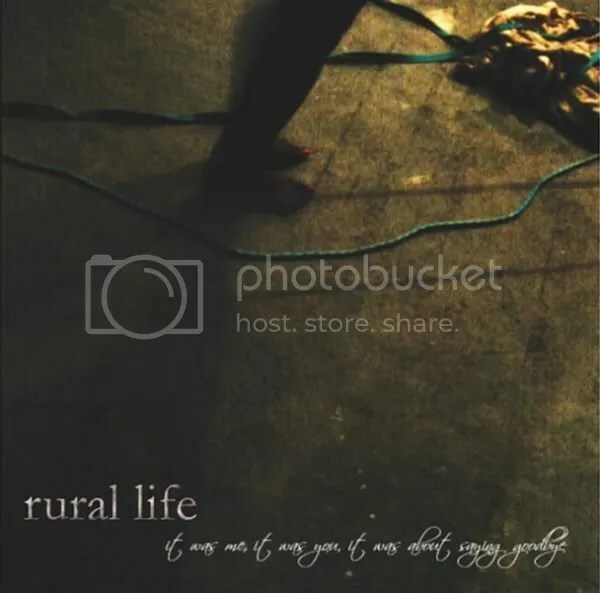 Rural Life is a group who have been with me for a while but about whom I’ve never succeeded in writing. I’m ashamed to say that despite being on my iTunes for a little under five months, I never really allowed them a fair portion of listening time until recent weeks. For those of you who’ve never had the pleasure it’s about time you bucked up your ideas. It Was Me, It Was You, It Was About Saying Goodbye is the debut EP from the duo Rural Life (chief songwriter Andrew Chu and producer Alex Beitzke), and although it doesn’t immediately grab the listener as one might hope, it soon becomes difficult to turn off. Opening track Mid-Autumn suggests a pop edge that lines the collection and doesn’t tie it up in complex guitar sounds or chord sequences. Although perhaps one of the weaker tracks, this and subsequent track Mountain Air allow the listener to adjust themselves to the lower octave vocals and appreciate the clever arrangements, that come into their own as the EP progresses. However, it is not until track three, Yours, Eli that It Was Me… really comes into it’s own. A devastatingly simple chord sequence underpins the first verse before the track subtly builds into a short tale of love and loss, making full use of the album’s careful and smooth production. From here, we move through the more upbeat numbers Oh! There It Is Right There with its nod to Jack Johnson and Life On Film, giving the ukulele another run out, before we are once again drawn into the sixth track, Firstborn. Although initially not overly different from earlier tracks, it is soon clear that Firstborn has a melody that requires the listener to…well…listen. Following the EP’s loose themes of departure, jealously and love, it talks of a Mother with her family (and firstborn child) and the jealously of not being a part of that. At it’s core it contains no more than five or six chords but it takes more than just a cursory glance to realize that this is all there is to it. With the dial firmly set to ‘stripped back’ we move past shortest track, Sometimes and reach the EP’s closer Saying Goodbye. Recalling the smooth electric guitar sounds of earlier track Yours, Eli, it sums the EP up nicely. Simple and clever production compliments the feeling of resolve and relief the track evokes. Not trying to end with flurry does the album no harm and succeeds in having the memorable effect that a barrage of guitars or vocals might have done. Needing no showy vocals, no extra guitars or no over-the-top production techniques, It Was Me… shows a maturity and simplicity that is seldom seen in the age of the Arctic Monkeys, and tips it’s hat to releases by Bon Iver and Johnny Cash, while retaining it’s own sense of identity. It’s by no means perfect, but shows enough potential that suggests that somewhere down the line, we might get something that will be approaching just that. While some might argue it’s nothing you’ve not heard before, I would happily bet it’s something you’d like to hear again and again. Below is an example of simple arrangement and uncomplicated production, allowing the song to shine through.